This advanced control continually adjusts the air/fuel ratio by comparing the combusted air oxygen level and comparing it to programmed set points needed to achieve the most efficient combustion. Eliminates challenges caused by barometric pressure changes and “play” in burner linkages. This solution will lower your fuel consumption and reduce greenhouse gas emissions. 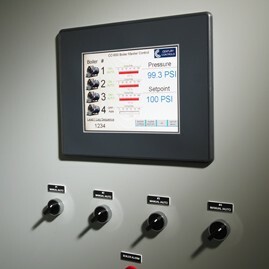 This advanced control will ensure your boiler is running for the right reason and at the best firing rate. Our solution provides a smart coordination of boilers to produce significant fuel savings and greenhouse gas emission reductions. By reducing the number of boiler cycles, this control also extends the life of boiler tubes and refractory. This control combines all features of the Century Boiler Master Control and the Oxygen Trim Control. 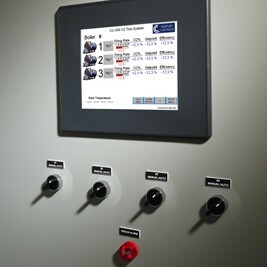 This system brings it all together, allowing you optimal boiler room efficiency. If reducing greenhouse gas emissions is the goal, this is the control for you. You will also see the benefits on your fuel and maintenance expense line.